Take this burning candle and throughout your life strive to give light with the brightness of faith and good works so that when the Lord comes you may go in radiance to meet Him with all the saints and without hindrance enter the chamber of His heavenly glory and reign with Him forever. n our everyday world, fire has both a negative and positive effects. A bonfire or a candle flame brings warmth and light but fire can also be very destructive, causing damage and ruin. Our church uses fire to represent God's presence, a presence that can comfort or scorch us. Our faith community proclaims that it is through baptism that we enter into the Resurrection and become "Children of Light." However dark may be the night that surrounds us, baptism remains the sacrament of entrance into light. It opens the eyes of the soul to see Christ, the light of the world (Jn 1:19). As Christians we live our baptismal commitment by responding to a personal call from God and reaching out to others through our vocation. By this, we help to make the light of Christ's presence burn brightly in our world. In the early Church the baptismal candle was always kept by the one baptized. It was brought to church on feast days, on the anniversary of one's baptism and for the Easter Liturgy. If the person was married, the same candle was used at the wedding. If he was ordained, it would be lit at his ordination. When the final hour of life approached, it was illuminated again as the soul went forth to meet its Judge. It was a constant reminder for the Christian to live and die by the light of Christ. The candles we light in church, then, should be an expression of the love that dwells within us because of our baptism into Christ. St. Paul says: "For the same God who said, 'Out of darkness let light shine, has caused His light to shine within us, to give the light of revelation ~ the revelation of the glory of God in the face of Jesus Christ" (2Cor 4: 6). We see in our icons that light always comes from within, the light of God resides in the inner person and emerges from within. There are no shadows since shadows are seen only when there is outer light. The Source of this inner light that cause the face to glow is the Holy Spirit. If the inner flame of God's love and presence is truly burning within us, it will express itself outwardly - in hospitality, in welcome to the lost - that offers warmth and the light of Christ. It will be an inviting flame, transforming us into burning and radiant lights for Christ. ery often the Lives of the Saints begin by relating how pious the parents of the saint were. Several things are usually emphasized: how much they prayed; how faithfully they observed all the feasts and fasts of the Church and also, how much they cared for the poor and those in need ~ sharing their material goods, and helping those less fortunate in whatever way they could. One of the things we learn from this is the crucial role that parents play, and how their good example is extremely valuable for their children, and the many people who are inspired and helped by them and their children. None of us chose our parents; this is always reserved to the goodness and wisdom of God. God creates each person with a unique design and provides a nurturing environment in which we can grow into the fullness of grace and maturity. We are commanded by God to honor our father and mother. Their role as the guardians of our soul and body is a difficult, challenging and demanding one that they seek to meet with love. One of the first and most important decisions they must make for us, is the selection of our godparents. Our godparents need to be chosen from among the saints. The primary criterion needs to be the faithfulness with which they live the Christian life. So often godparents are chosen because of their family relationship to the child, or because it appears that of a long standing friendship with one of the parents. In recent times, godparenting has assumed more of an honor to be bestowed, rather than, an important role to be fulfilled throughout the life of the child. The true light of Christ must burn clearly and brightly in those chosen to guide the spiritual development of their godchild. A life of holiness develops when we recognize our gifts and use them for the service of others. The baptismal candle produces heat. Heat, the warmth from fire draws us in when we are cold. Love, the warmth of another person's care and concern for us draws us together as people. It dispels the cold of fear and loneliness. The warmth of Christ's love for the world has come to us through the saints. The role of the godparent is to share the gifts of faith, hope and love in such a way that the lives of those entrusted to their love may be inspired and nurtured. alcolm Muggeridge wrote the story of Mother Teresa of Calcutta in a book entitled: Something Beautiful for God. He recounts an episode when the British Broadcasting Company (BBC) was filming a documentary about her. The script called for some scenes within Mother Teresa's Home for the Dying. However the rooms were dimly lit, with small, high windows. The photographer was certain that filming was impossible there. It was decided to try anyway since this particular ministry was central to Mother Teresa's ministry. The photographer also filmed some scenes outside in a sunny courtyard to be assured that the visit would not be a complete loss. When the film was processed, the part taken inside the home was bathed in a beautiful soft glow, whereas the part taken in the sunny courtyard was rather dim and confused. The film was checked and found to be perfectly good. Such a thing should not have happened. "I am convinced that the technically unaccountable light is, in fact, supernatural," Muggeridge wrote. "Mother Teresa's Home for the Dying is overflowing with a luminous love, like the haloes artists have seen and made visible . . . I find it is not at all surprising that the luminosity should register on a photographic film." ail, Mother and Virgin, imperishable temple of the Godhead, venerable treasure of the whole world, crown of virginity, support of the true faith on which the Church is founded throughout the whole world. Mother of God, who contained the infinite God under your heart, whom no space can contain. Through you the Most Holy Trinity is adored and glorified, demons are vanquished, Satan cast down from heaven into hell and our fallen nature again assumed into heaven. Through you the human race, held captive in the bonds of idolatry, arrives at the knowledge of the truth. What more shall I say of you? Hail, through whom kings rule, through whom the only-begotten Son of God has become a star of light to those who were sitting in darkness and in the shadow of death. Amen. nce Grandma told of an incident that happened to a newly commissioned navy captain who took great pride in his first assignment as the commander of a grand new battleship. One stormy night the captain saw a light moving steadily towards his battleship. He ordered the signalman to send the following message: "Change your course ten degrees to the north." The reply came back: "Change your direction ten degrees to the south." The proud captain was determined not to give way to another vessel, so he sent a counter message: "Alter your direction ten degrees. I am the captain!" The answer flashed back promptly: Alter your direction. I am a lighthouse!" Grandma says there are times when we are like that captain. Self-will sets us on a collision course. We stubbornly insist on our own way until the lighthouse of God's word penetrates and reveals the rocky shore ahead. And, if we are smart, we do what that captain must have done. We obey and alter our course. 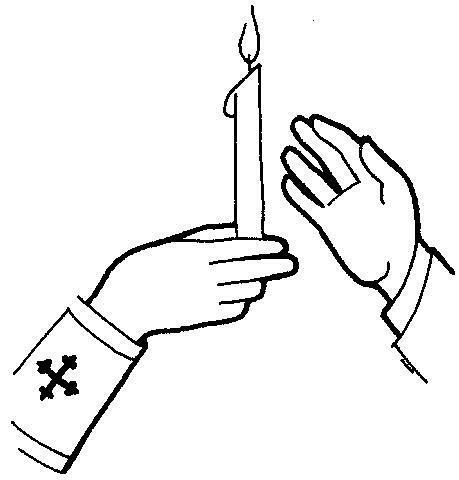 May the candle we receive at our baptism and use so often in our worship, serve to remind us of the light of Christ. May God's Word shine as a beacon in the darkness to lead us away from the destructiveness of sin to the haven of God's presence. Jesus is: "The light that shines on in the dark, and the darkness has never mastered it. There was a man named John sent by God, who came as a witness to testify to the light, so that through him all men might believe ~ but only to testify to the the light, for he himself was not the light. The real light which gives light to every man was coming into the world"(Jn 1: 5 - 9). Jesus said: "I am the light of the world. No follower of mine shall wander in the dark; he shall have the light of life" (Jn 8: 12). Jesus said to them: "The light is among you still, but not for long. Go on your way while you have the light, so that darkness may not overtake you. He who journeys in the dark does not know where he is going. While you have the light, trust to the light, so you may become men of light" (Jn 12: 36). n our Church the liturgical year develops in such a way as to help us be aware of the importance of the theme of light. The divine light first appears at Christmas with the birth of Christ. The light increases within Him and on Easter the light of Christ triumphs over the darkness. When the Holy Spirit descends with flames of fire, light reaches its full zenith in Pentecost. This progression should correspond to the growth of the inner light within our soul. The liturgical year reminds us that our inner light needs to continuously expand and guide our life. Generally there tends to be three stages of growth in the Christian. The first stage is when we come to know Christ as Friend and Master. The second is a personal experience of pardon and salvation, of the Cross and Resurrection. And the third is the coming of the Holy Spirit into the soul like a flame and with power. In this stage God establishes in us a true and lasting union. It is with St. Paul that we can boast: "Nothing can separate me from the love of Christ." The great saints all knew that Jesus, the Light of the World, was shining day and night in their minds and hearts. He was transforming them into a radiant light and they became bearers of the true light. Do we bear the light of Christ into our world in such a way that we become great saints?